No program better illustrates the pathologies of the weapons acquisition process as it is currently practiced by the Military – Industrial – Congressional Complex (MICC) than the entirely predictable, and in this case, predicted, problems dragging the F-35 Joint Strike Fighter into a dead man’s spiral. The F-35 in on track to be the most expensive program in the history of the Defense Department, and it has repeated just about every mistake we invented since Robert McNamara concocted the multimission, multi-service TFX — a program conceived with the same kind of fanciful one-shoe fits all imaginings as the F-35. Technical problems, cost overruns, and schedule slippages caused the TFX to implode into one of the most infamous debacles in Pentagon’s history. The result was the super-costly single-mission (deep strike), single service, swing-wing F-111. Planes were delivered without mission essential avionics and sat on the runway for two years awaiting parts. Production rates were slowed and total production quantities were reduced from 1,500 to 500. That cutback would have worked materially to wreck tactical fighter aviation in the Air Force, had it not been for the intervention of a brilliant iconoclastic band of military officers and civilians, who became known in the Pentagon and industry as the Fighter Mafia (their exploits are described here). The Fighter Mafia began its operation by saving the F-15 from going down the same pathway to swing-wing oblivion as the F-111, and then conceived the lower cost, high-performance F-16 and the lethal A-10 attack aircraft. Together these three airplanes were produced at sufficiently high production rates to modernize and expand the tactical fighter force in the late 1970s through the mid 1980s — something not achieved by any other major category of force structure. Ironically, the bulk of these airplanes were purchased with money appropriated during the Carter Administration. Costs skyrocketed and production rates declined as soon as the Reagan Administration began to flood money into Pentagon, because the contractors loaded these planes with bells and whistles … and raised prices, sometimes quite arbitrarily, according to official data I assembled while working in the Pentagon in the 1980s. Today there is no Fighter Mafia to rescue tactical aviation form the predators in the MICC. But the boondoggles remain: Like the ill-fated TFX, the F-35 is planned to be produced in high quantities for all three services. Like the TFX, the future of fighter aviation is dependent on the high F-35 production rates. Like the TFX the F-35 has suffered from chronic requirements creep, technical problems (engineering change proposals are now flooding in like water going over Niagara Falls — an official summary of the current technical problems can be found here). Like the TFX, the F-35 is suffering severe cost overruns, and horrendous schedule slippages as production rates are cut back. And like the TFX, the F-35, now entering its sixth year of low rate production, was put into production way before before its technical/cost problems were solved, a process known as concurrent engineering and manufacturing development that guarantees costly backfits and/or specification relaxations (known in the trade as ‘managing to a rubber baseline). But the F-35 program is not at serious risk, despite all the hysterical hype in the trade press — not by a long shot. The F-35’s political safety net has been front- loaded and politically engineered (the general practices of the power games are explained here) with exquisite malice of forethought. Domestically, the F-35 employs 130,000 people and 1300 domestic suppliers in 47 states and Puerto Rico. The only states missing the gravy train are Hawaii, Wyoming, and North Dakota. Internationally, there are already cooperative development/production plans involving nine countries, and more are in the offing. Given the intensity of the geographic carpet-bombing of contracts around the globe, can there be any question why the Secretary of the Air Force said in September, “”Simply put, there is no alternative to the F-35 program. It must succeed.” If you think that is an accident, dear reader, I have a Brooklyn Bridge to sell you. This entry was posted on March 29, 2014 at 6:16 am	and is filed under Uncategorized. Tagged: F-35, CDI, center for defense information, Fighter Mafia. You can follow any responses to this entry through the RSS 2.0 feed. You can leave a response, or trackback from your own site. Hope it never sees combat for the pilot on board. I’d say that it will get cut to 500 aircraft for the US (at best, USAF will receive 600 examples) and almost no export. Or at least I hope it will, for the sake of every air force planning to use it. Still the Norwegians closed all their bases to buy theirs and USAF generals recommend to smaller countries to disband their air-forces and pull their resources 2 or 3 countries to create a single air-force so that they can aford F-35. Yeah I know what you mean. The debate in Canada is still very heated. I bet most nations are having a heated discussion about this. What’s really sad is that with enough political willpower, I bet Canada could develop something like the FLX, although Canada not having designed many fighters in a while may encounter some issues there. That’s why you know the claims of under $100 million USD per plane are bunk – that’s simply not possible the way things are going. The Liberal (conservative) Government of Australia, under Prime Minister Tony Abbott has decided to go all the way with the USA with the purchase of 72 F-35As for $12.4 billion (their figures), and with the option to buy 18 F-35Bs for the Royal Australian Navy’s Canberra Class Amphibious Assault Ships. This at a time where Mr. Abbott and his treasure Joe Hockey have stated that there was a budget emergency and that Australia has to live within its means. The F-35 Will be a tragedy for all Air Forces except USA and others countries like Japan or Israel or South Korea cause the US support will help. That plane needs air superiority aircrafts + AWACS to perform a poor air to ground mission with only two bombs. That plane is a mistake except for LM and politics and high ranking officers earning money thanks to it. 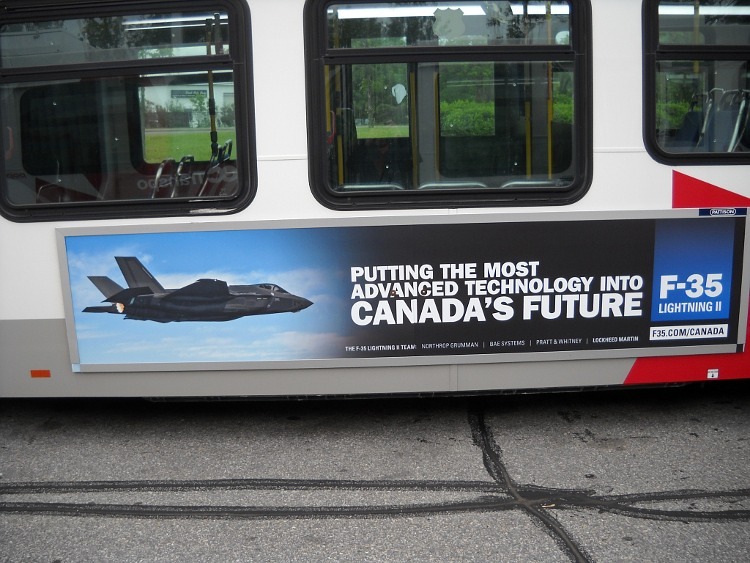 Also, check this out – a Lockheed Martin advertisement on a city bus. These are the main buses in my hometown. A short legs plane without good air to air capabilities for a vast country….! I took the bus yesterday. I actually saw that ad on the bus. But yeah, the F-35 makes no sense for Canada.